Way back in 1976, actor-director Ron Howard made a bargain with shlockmeister producer-director Roger Corman. 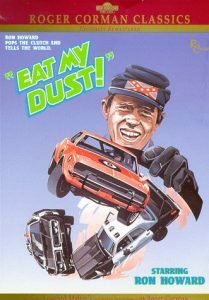 It went something like this: Corman agreed to produce Howard’s feature directorial debut, the 1977 Grand Theft Auto, and Howard agreed to star in another of Corman’s pieces of drive-in fodder, the quirky Eat My Dust! Written and directed by Charles B. Griffith (a favorite screenwriter of Corman’s who penned the original Little Shop of Horrors, among many others), Eat My Dust! is as wacked-out as anything to come out of the American International Pictures factory, and it is still surprisingly fresh and funny. Howard plays Hoover Niebold, son of a small-town, no-nonsense sheriff (Warren J. Kemmerling) and a prime candidate for dreary obscurity with his nowhere job and dull love life. Hoover takes a risk and asks out a popular girl (Christopher Norris), but after she demands that he steal the car of a professional racer (Dave Madden), the young hero abandons his innocence for a wild ride.